Sin was the problem. Grace was the method. Intimacy was the goal. Holy Week, Good Friday and Easter have come and gone, but I want to pause today to reflect on the significance of this most holy season and what it means for your marriage. What Does Easter Have to do With Marriage? Actually, a lot more than you might think. For starters, you have to understand that marriage was on God's heart before time began. Before he set the world in motion, he knew he would need to send his Son, Jesus, to claim an eternal bride. Marriage, your marriage, is the picture God chose to show us his passionate pursuit of us. Next consider the symbolism of the Lord's supper on Maundy Thursday. In celebrating the Passover, Jesus takes a cup of wine and offers it to his disciples. This act mirrors the traditional Jewish offer of betrothal in which the groom offers his bride a cup of wine. If she accepts it, she is accepting his marriage proposal. She is declaring her acceptance of the marriage covenant. In effect, she is saying "I am yours, forever." The forgiveness of our sins was not the goal of the cross. I realize that statement could be misinterpreted, but hang with me. Yes, sin was the problem that separated us from God. Sin needed to be dealt with, and Jesus was the only One worthy of that task. But forgiveness was not the goal. You see, I believe that sin was the problem. Grace was the method. But intimacy was the ultimate goal. Jesus stepped out of heaven, came to earth and died a cruel death in order for us to have an intimate and eternal relationship with God, starting right now. Easter, by way of the cross, gives us intimate and permanent access to the Father. In religion we have a tendency to get hung up on rules. Rules make us comfortable, because we think they tell us if we are okay or not. Are we "in" or "out?" Are we "good" or "bad?" But Jesus came to do away with the law (rules) and to replace it with His grace. We are "in" and "good" because of Him. No good we could do got us in. Grace got us in and keeps us in. How often in our marriages do we put rules ahead of the relationship? Our rules are all the expectations and demands we heap upon our spouse. It's the bar of acceptability we require them to jump over before we will love them in return, before we will surrender ourselves to them, before we will give back. In the afterglow of Easter, consider the extravagance of Jesus' offer of grace, and consider the unconditional nature of his love for us. Love your spouse like that. 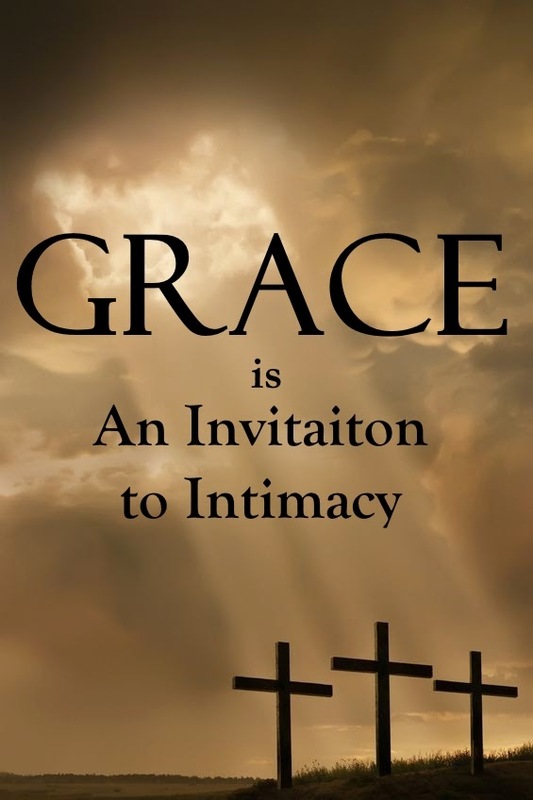 Grace is an invitation to intimacy. It's as true in your marriage as it is in your walk with God. Are there areas where you have let rules and expectations hinder intimacy? Consider how growing in grace toward your husband or wife might deepen the intimacy between you. Move in the direction of grace and see how love, intimacy and passion grow in your marriage. I was inspired to write this while reading Kate's excellent post over at One Flesh Marriage, 3 Things the Cross Teaches us About Marriage. Be sure to check it out.